It was the beginning of Hanukkah as well as Thanksgiving evening and the teams that New York Ranger and New York Islander prospects were in a giving mood. There were 4 games played and all 4 were losses for the teams that the prospects were playing for. The gift giving started early and often in a couple of the games. 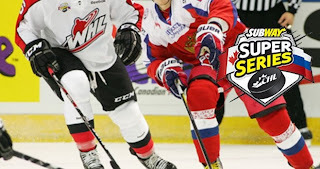 In Red Deer, game 5 of the Subway Series was being played as the Russian Selects took on Team WHL which had Griffin Reinhart (NYI 2012 1st) playing for them. Reinhart had the only highlight of the night for the prospect scoring a goal against the Russians just 45 seconds into the game. Reinhart following the play picked up a loose puck in the offensive zone and fired it past Russian goalie Ivan Nalimov giving Team WHL an early 1-0 lead. The lead would not hold as Russia would take Game 5 3-2 thanks to Nalimov just standing on his head stealing the show by stopping 42 out of 44 shots. The highlights are here as Russia will take a 3-2 series lead into the final game on Thursday in Lethbridge. Ryan Pulock (NYI 2013 1st) will be suiting up for Team WHL in this one. Victor Crus-Rydberg (NYI 2013 5th) and his Plymouth Whalers were giving away gifts as they gave a game away to the Owen Sound Attack 3-1. The Attack scored 14 seconds into the game and had a 3-0 lead just 13:15 into the game scoring their 3 goals on their first 10 shots. Crus-Rydberg was scoreless and a -2 on the night. Ryan Graves (NYR 2013 4th) was scoreless, a +1 with 1 hit but his Charlottetown Islanders dropped a 3-2 shootout to the Saint John Sea Dogs. The Islanders are winless in their last 3 games. Anthony Duclair (NYR 2013 3rd) was scoreless, a -1 on 2 shots with a minor for goalie interference that was turned into a power play goal as Duclair's Quebec Remparts lost 5-2 to the Chicoutimi Saguenéens. It was just not a good game out of the Remparts as they trailed 3-1 after 1 period and this game was over with. Here is hoping that all of you have a safe and enjoyable Thanksgiving with your friends and family. Might I ask that when you are with those who mean the most to you that you make sure to tell them what they mean to you. As events have shown in today's world in just the blink of an eye, they could be gone. And let us say a special word of thanks to those who protect our nation, to those who patrol our streets, to those who run to danger while others run away. Without them we do not get to enjoy the holidays like we do.